Gremlins: I do apologise for a number of errors in last week’s column, I think the heat upset my computer and my head. Our Bell Ringers: were on ITV not BBC and they had a quick airing, blink and they were gone, however the gist was to recruit more Bellringers. If you fancy a go pop into St George’s Church on a Monday Evenings at 7.30pm or contact Andrew on 882727 they will be pleased to hear from you. I think you have to be over 14 years old. Friday 27 July: Brede Farmers Market is from 10am – 12 noon in Brede Village Hall. We are so lucky to have this on our doorstep weekly. Please support then if you are able. WEA is in Udimore Community Hall at 11.30am. Brede Short Mat Bowls at 7.30pm. Saturday 28 July: Emma’s Baby Princess Ballet for 3 to 6 year old children in Brede Village Hall at 10am. At St George’s Church, a sung Family Eucharist will be held at 9.30am Father Martin can be reached on 01424 883408. The Church’s Website is http:/www.stgeorgesbrede.org.uk other services held during the week is in the Church Parish Magazine. Broad Oak Fire Fighters Fȇte 1pm at the Recreation Ground. There will be lots to do and see. There will be a BBQ, cream teas and cakes to eat. Time off for mum –no cooking today. Hooray! The Brede Scout sections are all closed for the summer holidays and will return in September. They hold their meetings in the Scout Hut Stubbs Lane. You may still contact the leaders if you wish you child to join in September please contact the Leaders of the section you wish to join. Pilates with Susan at 6pm in Udimore Community Hall followed by an Exercise Class at 7.30pm. The Whist players will be in action in Brede Village Hall at 7.30pm. Tuesday 31 July: Pilates with Susan at 9.15am in Udimore Community Hall. Brede Painting for Pleasure is today at 9.30am in Brede Village Hall. Pilates is at 6.45pm in Udimore Community Hall. Brede Scouts have finished now until September when they will meet, from 7pm – 9pm in the Scout Hut and any young person 10½ or over is welcome. Contact Luciano Frige on 0781 1339626 The Group Leader is Colin Ward and can be contacted on 07980 171877 or colinward3@sky.com if you would like your child to join any of the sections or help as a Leader or helper. Wednesday 1 August: Pilates with Susan at 9.15am in Udimore Community Hall. Yoga is in Brede Village Hall from 9.30am – 10.30am followed by Brede Crafters at 2pm until 4pm. Thursday 2 August: Pilates with Susan at 9.15am in Udimore Community Hall. Pilates at 6.30pm in Brede Village Hall. Friday 3 August: Brede Farmers Market in Brede Village Hall from 10am – 12noon. Brede Painting for Pleasure Group: hold their annual exhibition of work on the same weekend as Brede Flower Festival, so make this Bank Holiday an opportunity to smell the flowers and see the pictures. The exhibition is in Brede Village Hall, from 10-00 on Saturday, Sunday and Monday. Good parking and refreshments as well as a raffle opportunity to win original paintings. The hall is only fifteen minutes walk along Cackle Street or a two minute drive from the Church. 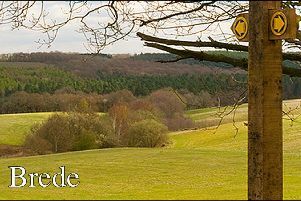 Make Brede your destination of choice: this coming August Bank Holiday. If you come on Bank Holiday Monday the Steam Giants are open too from 10am. You could have a wonderful time and spend the whole day in the Parish. Please: let me know in good time if there is anything you would like put in the column.